Hairstyle has been very trendy in recent days. Braids are a conventional way of styling hair. But, Box Braids are especially worn by the black men. This is a distinct hairstyle of their own, though nowadays it has become popular with all. If you have already planned to have box braids as your go-to hairstyle, you are at the right place where you’ll get all the resources to get box braids. The name says it all. Box braids are braids that are squared off and look like tiny boxes spread all over the hair. These braids may be of different sizes and length. The most amazing thing about box braids is that they are not fixed to the scalp hence there is scope to modify the braids in many ways. We love these jumbo box braids for men, but it takes a long time to finish the style. And, to do the right kind of box braids, one must have great skill and expertise. There are hundreds of ways to follow when you are having a box braided hairstyle. 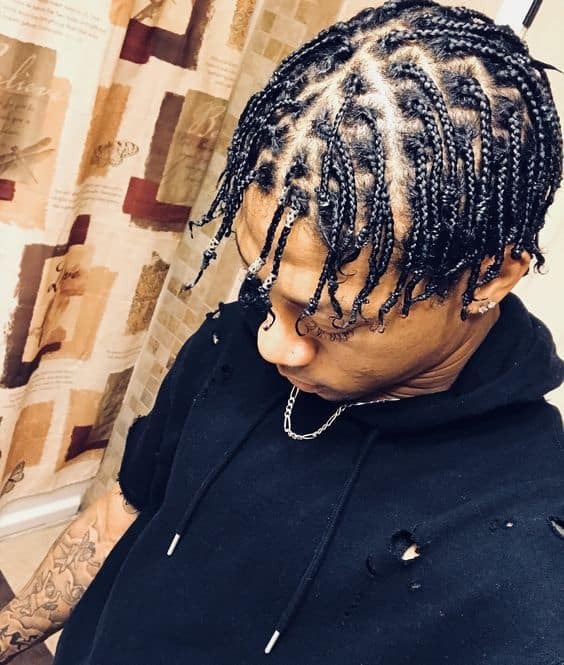 We have gathered the best box braids for men at a single place for your convenience. Get inspired by our top picks. 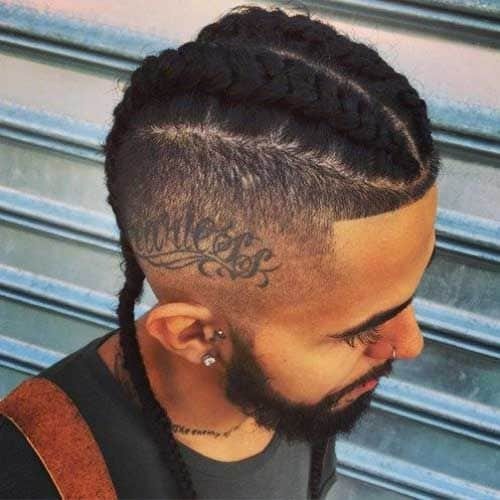 Hope you all will like these men’s popular box braided hairstyles and of course try them on your hair. Cornrows are a very common and popular hairstyle among the black men. One can make the rows using box braids. Though most of the box braids are done right from the root of the hair, you can also apply the braids on the outer part of the hair. 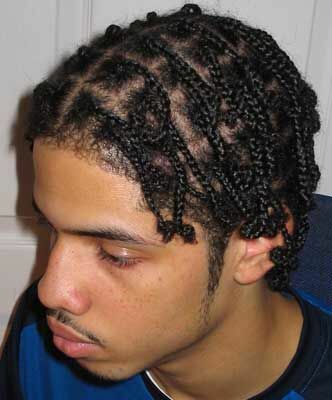 This type of men’s box braids can be worn in regular life. The natural hair has been turned into box braids. Artificial braids look more beautiful as natural hair is tough to style with box braids. So extensions can play a big role here. The white scalp and the black color is a great combination to look noticeable. One can apply extreme parting to get such hairstyle. If you want to make your look more gorgeous then associate the box braids with an undercut hairstyle and medium beard style. You can get awesome beard inspirations from beardstyle.net. Some men prefer a straight pattern of rows. Well! You can get a wavy one to add glam to the box braids. Usually, men’s long box braids are made of hair extensions. But you can also use the natural hair to get long box braids. Hair bun and box braids, both these styles have been blended together. They look gorgeous in this joint venture. This sort of hairstyle surely demands a high price in the salon. You can get this complex design done at a professional salon. Are you a man who is looking for a creative box braided hairstyle to get instant attention? Get a leafy design done on your head to prove the grace of your style. Make box braids and arrange them in an order so that it looks so well organized and beautiful. These curved cornrows will make men’s hair look amazing. One can get a faded hairstyle with some prolonged box braids hanging on the back. Hair bun is commonly donned by those guys who have long hair. You can apply that to your long box braids too. A hair enthusiast will never be happy with a simple hairstyle. If you are one of them, try this handsome hairstyle. Apply box braids to the hair as here depicted in the pic. Then create a central parting in the middle with the association of two hair buns. 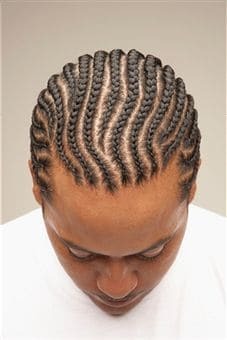 One of the most common box braid hairstyles for men. A layered haircut and a box braid hairstyle will make an amazing style if blended well together. Hair extensions are a very handy element to make the style look more attractive and impressive. But one must be very patient while getting this sort of extreme style. A faded haircut can be associated with box braids and beard to make the best out of a hairstyle. As hairstyle is a comprehensive thing, it looks good with a beard. Some guys love long hair no matter what type of style they are going to do. This is a proper demonstration of long box braids. It’s not written in any rulebook that the patterns must be a defined one. Let’s adorn your hair with an undefined pattern of the box braids. 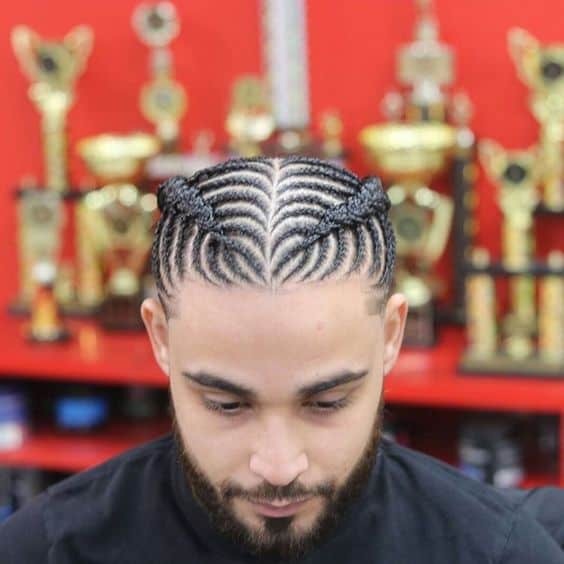 A unique box braid idea for men who love hair designs. Chevron shapes have always been an element of fashion and style. You can use this pattern while getting box braids done. Stripes can change the total outlook of a hairstyle. And a hair bun can enhance the beauty to a great extent. Keep the box braids to the length of ear all around the head. You will look well-groomed and aesthetic with this hairstyle. This style entirely depends on the artificial hair extensions. Use extensions of two colors to get stunningly beautiful colors like this one. Box braids are really a great way for men to get a chicer look. It will create a bohemian ambiance at your hair tips. This style is very easy to carry once it is done perfectly. One can get box braids at a salon which is often very costly. You can get the best of it even at home by adding artificial hair to the natural hair or turning the natural hair into box braids. But that, of course, involves the assistance of others. It’s quite impossible to do box braids alone. Let’s see how you can get such amazing box braids for men at home. Prepare the hair: Before doing any sort of styling make the hair ready for the upcoming toils. Get a good shower with good quality shampoo and apply moisturizer to the hair. Prepare the synthetic hair: Cut and trim the artificial hair which is to be attached to the real hair. Usually, synthetic hair has straggly and unexpected fiber. Get rid of that. Section the hair: Comb the hair using a wide-toothed comb and make a small section of the hair dividing that into three pieces. Design the synthetic hair: Now take a section of synthetic hair and start braiding. Attach the hair: Now attach the braided hair to the natural hair using the previous three pieces of hair section. Treatment: Dip the tips into hot water so that the braids gets tight and last longer. Repeat the process to other sections of hair. If you already have box braids, take notes of the following things. You must not forget these instructions if you want to know how to take care of the box braids. First of all, never keep the braids wet. Dry them up right after when it gets wet. Don’t pull so tightly at the time of doing the braids. Protect the hair during night time. A very well styled box braid hairstyle may get ruined just because of the wrong sleeping position. Wrap the hair to trap the moisture inside and to protect the braids. Apply moisturizers to the hair to keep it safe from getting frayed and dry. Wash the hair and braids at least once a week. Make sure that the hair is not braided for a long time. Keep the braids for two months at max at a stretch. More than that will harm the hair. The fade haircut is famous worldwide for the distinct look it gives. You will be noticed by the people around you, and people will understand that you are having a haircut. For this expressive nature, fade is becoming more popular with the passage of time. Imagine the association of bix braids with a fade haircut. Yes! That will surely turn heads of the beholder at the first sight. So, men’s box braids with a fade is a wise decision of anyone ever want to stand out from the crowd. The process is also easy. Get a fade haircut around the head keeping the top open for the box braids. Then attach the box braids with the natural hair and get the glam of them very easily. 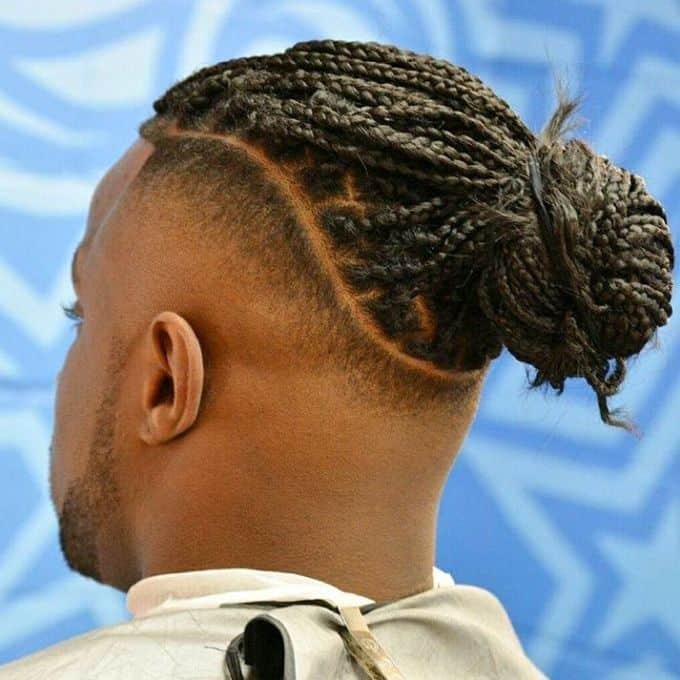 Men’s box braid hairstyles with fade might be the next trendsetter if you can style that with elegance and excellence. Box braids are somewhat critical hairstyle. Beginners will struggle for sure while having this hairstyle. They need guidance and inspiration to do it correctly. That’s why we have depicted necessary information for you about the ins and outs of box braids. Try this gorgeous style to spend a wonderful time with the braids.